The book you've been waiting for from New York Times best-selling author Karen Kingsbury Leaving is the first volume in a new series that features members of the popular Baxter family and finally completes the Bailey Flanigan/Cody Coleman story. ^^^The Bailey Flanigan series begins with Bailey leaving Bloomington for the adventure of a lifetime. She has won an audition for the ensemble of a Broadway musical in New York City. ^ ^She's determined to take advantage of this once-in-a-lifetime opportunity, but is she really ready to leave family and friends for the loneliness of the city? And what of Cody? His disappearance has her worried about their future and praying that their love can survive. In order to be closer to his mother in jail, Cody takes a coaching job in a small community outside Indianapolis. New friends, distance, and circumstances expose cracks in his relationship with Bailey Flanigan. Love, loneliness, big opportunities, and even bigger decisions highlight the first book in the new Bailey Flanigan series that features members of the popular Baxter family and finally completes the Bailey Flanigan/Cody Coleman story. About "Leaving (#01 in Bailey Flanigan Series)"
The Bailey Flanigan series begins with Bailey leaving Bloomington for the adventure of a lifetime. She has won an audition for the ensemble of a Broadway musical in New York City. She's determined to take advantage of this once-in-a-lifetime opportunity, but is she really ready to leave family and friends for the loneliness of the city? And what of Cody? His disappearance has her worried about their future and praying that their love can survive. In order to be closer to his mother in jail, Cody takes a coaching job in a small community outside Indianapolis. New friends, distance, and circumstances expose cracks in his relationship with Bailey Flanigan. Love, loneliness, big opportunities, and even bigger decisions highlight the first book in the new Bailey Flanigan series that features members of the popular Baxter family and finally completes the Bailey Flanigan/Cody Coleman story. Customer Reviews For "Leaving (#01 in Bailey Flanigan Series)"
This novel had me hooked from the very first page! It was my first foray into Karen Kingsbury's 'Baxter' series, and I was amazed at just how 'Christian' the story was: the characters are constantly praying, seeking God's Will, and supporting each other in the faith. I commented to my friend that 'the word Jesus is in just about every paragraph!'. This novel with challenge and inspire you to grow closer to Christ. This is definitely not a stand-alone book - you will be desperate to read the rest of the series, and fast! While you don't have to have read the previous Baxter series preceding this Bailey Flanagan series (the Walk the Line novels) they do provide a background to the story. Karen Kingsbury is so gifted at creating characters you can relate to and understand. Bailey is no exception. I thoroughly enjoyed reading 'Leaving' and found the story line was well paced, engaging and relatable to me as a young Christian woman. My only mistake was not only taking this first book in the series on holiday with me! I was eager to read and continue enjoying Bailey's story. I found this book very easy to read. The book was about a young Christian girl following her dream and moving into unfamiliar world with God's guidance. I thoroughly enjoyed it. 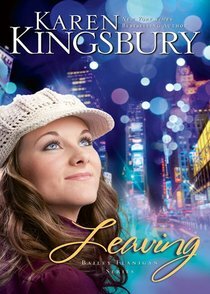 Learning, book two in The Bailey Flanigan series, picks up where Leaving ended. Bailey Flanigan and Cody Coleman are not only separated by physical distance, they are also faced with great emotional distance. Can distance truly make the heart grow fonder? Find out in this poignant love story, featuring members from Karen Kingsbury's popular Baxter family.